The first review is from The Police History Society and is very complimentary. Thank you to the reviewer. The police popular journal "The Police Review and Parade Gossip"
Popular journals are a good way to understand their target audience. In the case of The Police Review and Parade Gossip, it helps us to understand the work and lives of the policeman on the beat and his family. It was started in 1893 by the philanthropist and temperance campaigner John Kempster who invested his £500 savings because he saw a need for policemen on the beat to have a voice and to improve their standard of education and training. It became the most widely read weekly police journal during the First World War and was referred to by government for the views of policemen generally. Files in the National Archives at Kew have cuttings taken from the journal pasted in to letters and correspondence between ministers and civil servants about topical police matters. Widely read and influential journals are important sources for historical research as they have to reflect the views of their readers, or they lose their target audience; they also help to form opinions through the articles they produce - so that they become a reflector and arbiter of opinions. No journal can afford to be out of step with its readers. Researchers on police history have called the journal's editor enthusiastic and forceful, with the journal being a mouthpiece for the respectable, educated working man who served as a policeman and also had rights as a citizen. It encouraged the moral values of stability, self-improvement, thrift and sobriety and showed the policeman as respectable, self-disciplined and self-taught, which was close to the values the police as an organisation promoted. It also campaigned for better conditions of service for the policeman, such as the successful campaign for the weekly rest day, which became enshrined in legislation in the Police (Weekly Rest Day) Bill of 1910. Below is the front cover of the journal, from the first publication after the Armistice in November 1918. Sadly it ceased publication in 2011 after over 110 years in print. 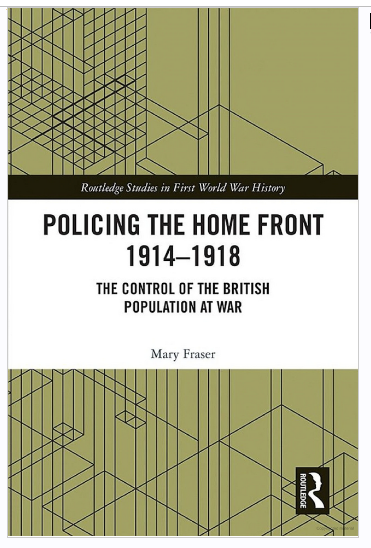 Fraser, M. (2018) Policing the Home Front 1914-1018: The control of the British population at war. Abingdon: Routledge, First World War History Series. Clapson, M. & Emsley, C. (2011) Street, beat and respectability: The culture and self-image of the late Victorian and Edwardian urban policeman. In Williams, C. A. (ed.) Police and Policing in the Twentieth Century. Farnham: Ashgate Publishing Chapter 14, pp. 293-317. 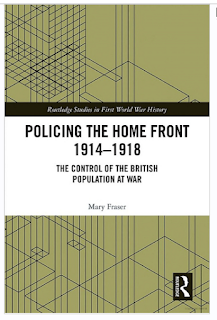 Book publication "Policing the Home Front 1914-1918: The control of the British population at war"
It has been an immensely exciting project and will undoubtedly lead to further work on the history of the police in Britain. As the First World progressed into 1917 with a crisis of diminishing food supplies and soaring food prices, the discourse of food hoarding became part of the policeman’s role. Hoarding became prominent following Conscience Week on 11th February 1917 when Food Control Committees gave an amnesty until 25th February to allow the surrender of all hoarded food, which was to be sold and the proceeds given back to the person surrendering. But although the results were disappointing, the message that hoarding was a serious matter became well known and was everybody’s business to control it. But further measures were needed as questions in the House of Commons in March 1917 asked for stricter control noting that poorer people were becoming dissatisfied at seeing the indulgence of the rich . A furore which spread across Britain and lasted for several weeks was created in the West Riding of Yorkshire by publication of an article showing the lavish diets eaten by the wealthy at The Ritz, this fuelled claims that hoarding by the rich was causing the food shortages. Later a stricter definition of what constituted hoarding was asked in the House of Commons , so that everyone could be aware of their relatives, friends and neighbour’s habits and could report them to the police or the food control authorities where they had suspicions that the law was being infringed. The Food Hoarding Order of 15th April 1917 forbade anyone to “acquire any article of food so that the quantity in his (sic) possession or under his control at any one time exceeds the quantity required for ordinary use or consumption in his household or establishment”. Under the Order powers were given to Food Inspectors to enter any premises where they suspected hoarding, except by food producers and traders, but the Order was not implemented until early 1918, when the local Food Committees started to enforce it. Food Inspectors secured convictions, fines and in some cases imprisonment too, against hoarders. The police were told that the Food Hoarding Order gave right of entry to premises where “an offence against the Regulations is being or has been committed”. Under Section 51 of the Defence of the Realm Act (DORA) , the police could enter the house or building to “examine, search and inspect” anything that they suspected contravened DORA Regulations, such as food hoarding, and an officer could seize anything he saw without written permission from the Food Controller or a Justice of the Peace. Whereas Inspectors appointed by the Food Controller or the Local Food Control Committee had the right of search and could seize articles contravening the Food Hoarding Order without a warrant, the police were warned that “violating … an Englishman’s right to the privacy of his hearth and home, is not to be lightly exercised”; and they would be well advised to act with the utmost discretion and with the permission of their superior officer before attempting such a move . The police therefore mainly relied on tip-offs from the public, traders and others with close access to families to report hoarding. A whole system of checking and controlling the food supply and hoarding had been set up, involving specially appointed inspectors who could call on police help to bring convictions. Beveridge shows how publication of convictions of high profile figures (a best-selling novelist; an Earl’s daughter; a Member of the House of Commons) brought contravention of the Food Hoarding Order out into the open so that few could escape. Fraser, M. (in press) Policing the Home Front 1914-1918: The control of the British population at war. Routledge, Research Monograph.